The national marine sanctuary in Monterey Bay is cracking down on drones flying over nursing seals and their young during mating season. Hopkins Beach, at the center of the sanctuary, is where about 100 harbor seals sleep, mate and give birth from February through June. Elephant seal pups also roam California beaches this time of year—most notably at Año Nuevo State Park where seal moms depart in mid-March. 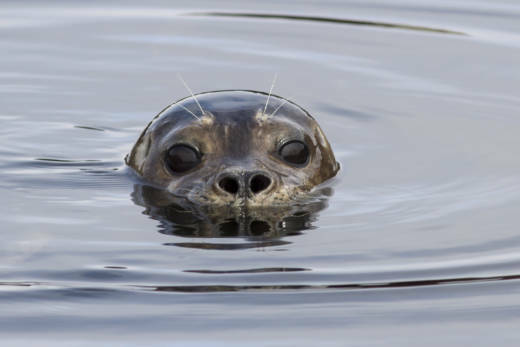 This year marks the first time that The Marine Mammal Center, based in Sausalito, has received complaints about amateur drones "harassing" seals. The center performs wild animal rescues and rehabilitation of distressed and injured animals in Northern California. "Drones are totally foreign to these animals," says Laura Chapman, a rescue coordinator with The Marine Mammal Center. "They make a sound that they [the animals] don't expect." Seals nap during the day so if they're startled by a buzzing drone it interrupts their sleep cycle, says Chapman. "What we want people to be aware of is that if an animal is looking at you, if they're looking at the drone, that animal is being harassed." Chapman says noisy drones flying above the beach can cause the animals to alter their natural behavior during their prime reproductive and pupping season, when mother seals need to bond with their young. Harbor seals only have about five weeks to nurse and teach their young how to survive before the baby animals are on their own. "These animals are really sensitive and they need that time, the pups need that time with mom," says Chapman. The biggest concern, says Chapman, is that easily frightened moms will abandon their pups. The Marine Mammal Center doesn't know how often this is happening due to drones, but they're concerned that the number of abandonment incidents could rise. Humans are already having an impact on the seals—from kayakers encroaching on the seals' turf to off-leash dogs barking at the animals. Over the past decade, The Marine Mammal Center has handled 140 cases where humans harmed seals or sea lions. The disturbances include seal moms abandoning their pups because of human presence, and well-meaning visitors attempting to "rescue" the animals by picking them up. In 2014, for example, a family hoisted a baby seal they thought was abandoned into their minivan. "It’s not the best case scenario for the animal to be picked up and driven around in a minivan," says Chapman. "The best case is that mom would come back for her pup." Docents at the Monterey Bay National Marine Sanctuary say drones flying over Monterey beaches aren't just a nuisance—they're breaking the law. 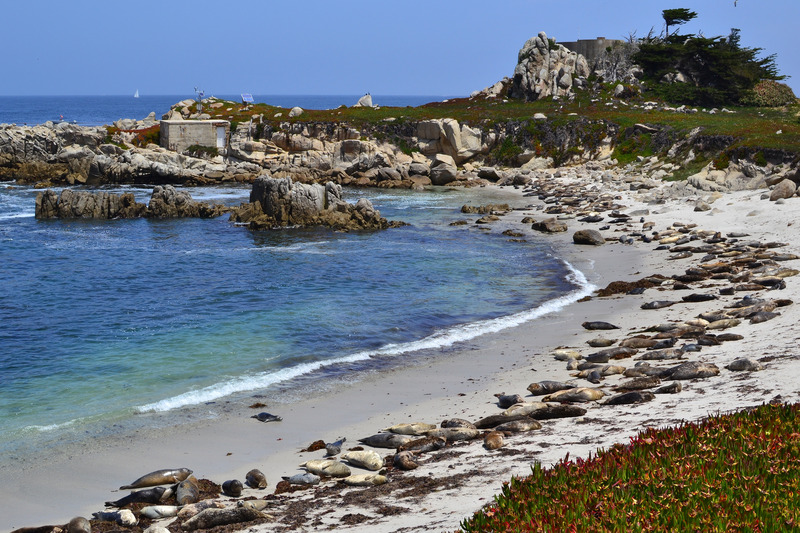 The Federal Aviation Administration bans drone use within five miles of an airport without prior approval and the Monterey Regional Airport is just 3.5 nautical miles from a harbor seal rookery near the Monterey Bay Aquarium. 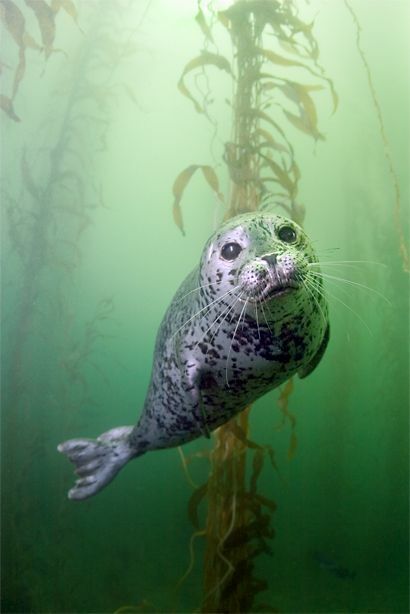 A California harbor seal near "tank reef" an underwater diving spot in Monterey. And the federal Marine Mammal Protection Act safeguards seals from harassment and requires beach-goers to stay 150 feet away from them. The marine sanctuary in Monterey is monitoring drone use, relying on volunteers to tell drone users to take their vehicles out of the sky. Thom Akeman, a docent with the sanctuary, regularly patrols Hopkins Beach where harbor seals breed. He's approached several drone operators, asking them to stay away from the resting animals. Akeman says he's not sure why people are flying drones over the beach, and whether or not they're capturing video footage. But he says his priority is convincing drone hobbyists to take the aircraft out of the sky. "About half the time they’re very cooperative," says Akeman. "Other times they’re very belligerent because they think they have a right to fly anywhere." Akeman has a tip for concerned beach-goers. If you're strolling along a Monterey beach and happen to see a drone, notify one of the docents. As for a stranded seal pup, Laura Chapman says don't try and rescue it. Give the animal space, let the mother return and if you're still concerned, call the Marine Mammal Center.